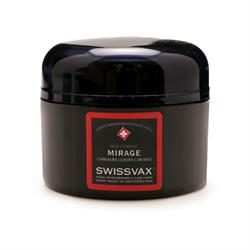 Sample Swissvax Mirage Wax - Ideal For Modern Paintwork. Swissvax Mirage Wax contains a high concentration of ultra pure Brazilian No.1 grade carnauba wax (over 40% by volume) and is excellent for modern water based paints. Enriched with coconut and avocado oil extracts to feed the paint and produce a brilliant streak-free shine. Once applied, it sets hard creating a durable protective layer over the paintwork preventing contamination and damage.